I love everything about Thanksgiving. I love the planning. I love having my son home. I love setting my table. I love making turkey stock. 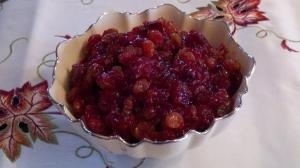 I love cranberries, especially my homemade cranberry compote. I love stuffing. I love mashed potatoes. I love pie. I love that it is a holiday without gifts. I love the smell in my house. I love homemade anything. Ask anyone who spends days preparing a meal and they will likely tell you the cook barely tastes anything that day. Friday, even before anyone else rises I have already had a piece of dark meat, a scoop of cold dressing and a slice of chocolate pie. I have been known to hide a piece on Thanksgiving for my coffee time in the morning. Yum! Brush Extra Virgin Olive Oil and rub garlic over bread. Today and every day I am thankful for my husband, son and family who love me, a home to share with those I love and the freedom to do as I please. I am also thankful for Tim and Dawn Schmitt who have given me the opportunity to chat with you each Thursday.